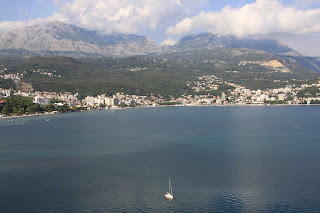 I tried to jam all of my Montenegro visit into one blog entry so I could write less, but the photos would not have it. There were too many good ones. 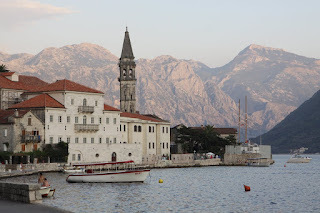 I did not get to experience virtually any culture in Montenegro. I was restricted to seeing the unbelievable sights in nature. 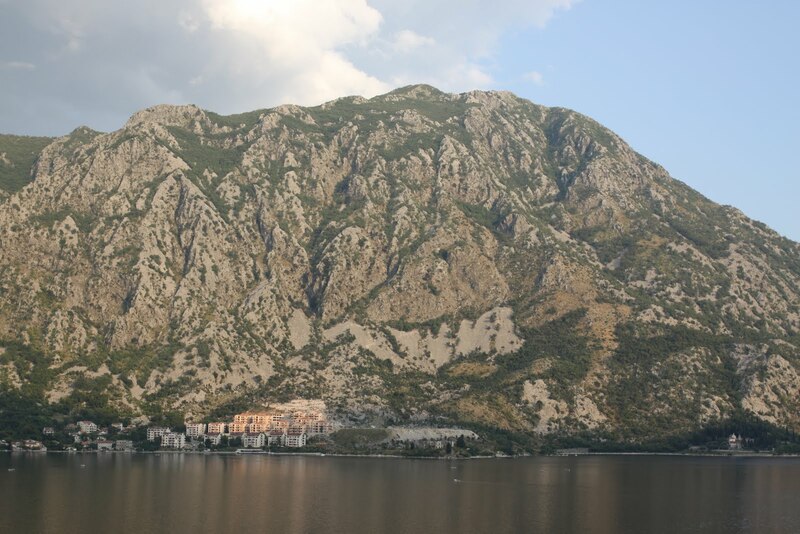 Davida's and my first big destination was the Bay of Kotor. 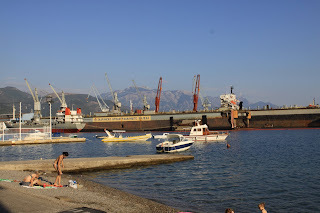 The Bay of Tivat leading into the Bay of Kotor. 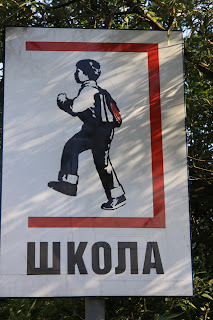 A sign for kid's crossing, maybe marching, the road. Thanks to Davida's map, we found a side road and smaller border crossing to use. There was almost no traffic. We stopped at one cafe that seemed stuck in the 1970s. As usual, Davida had coffee. I had ice cream. We were the only customers and wondered if any others came by. We couldn't believe that such an out of the way place was in business. As we were leaving, a fire truck came by with one person. 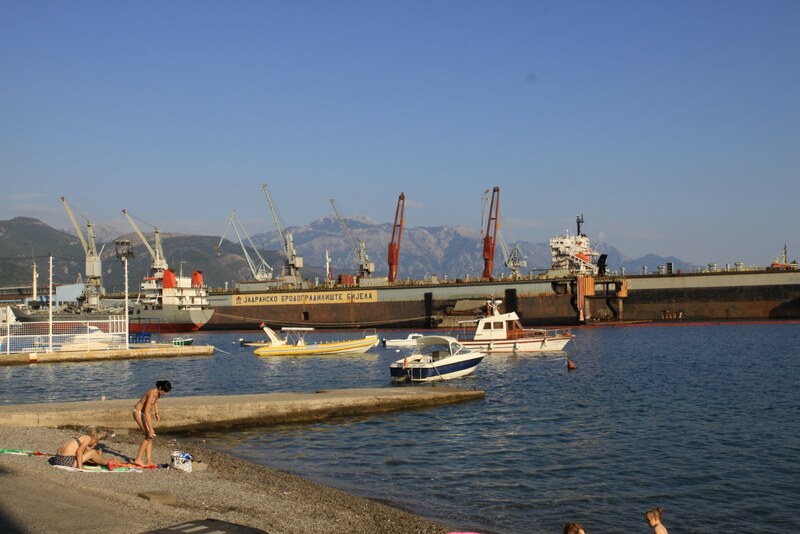 I don't think I have ever seen industrial ships so close to where people swim. In a small country, I guess you make do with limited waterfront. 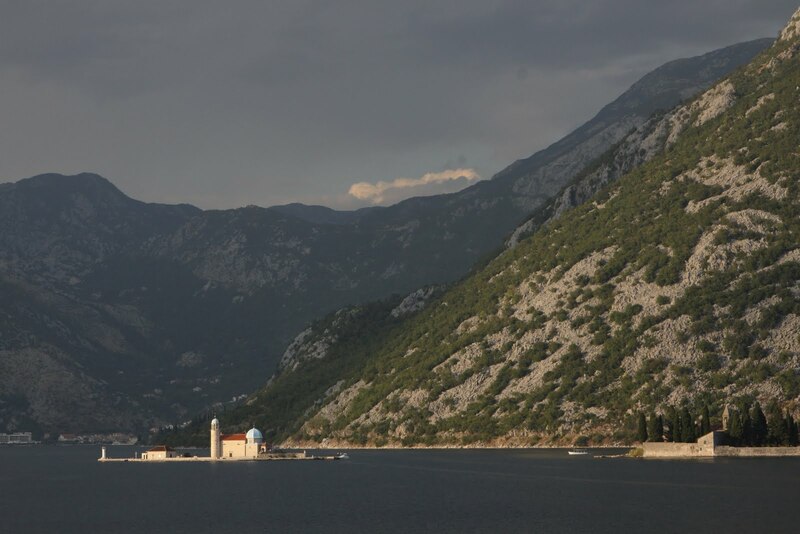 One of the amazing views on the way to the Bay of Kotor. Somewhere along the way and while admiring the scenery, a bug flew into my shirt. I gave the shirt a quick yank to let it out and did not think any more of it . . . . until it stung me. Freakin' bee. I wasn't sure if it was the kind that left its stinger in you and died or would keep stinging, so I came to a screeching halt on a steep descent, fumbled for my helmet strap, yanked it off, and finally got my shirt off to let the bee out. Oh silliness. I am sure it was ridiculous to watch. 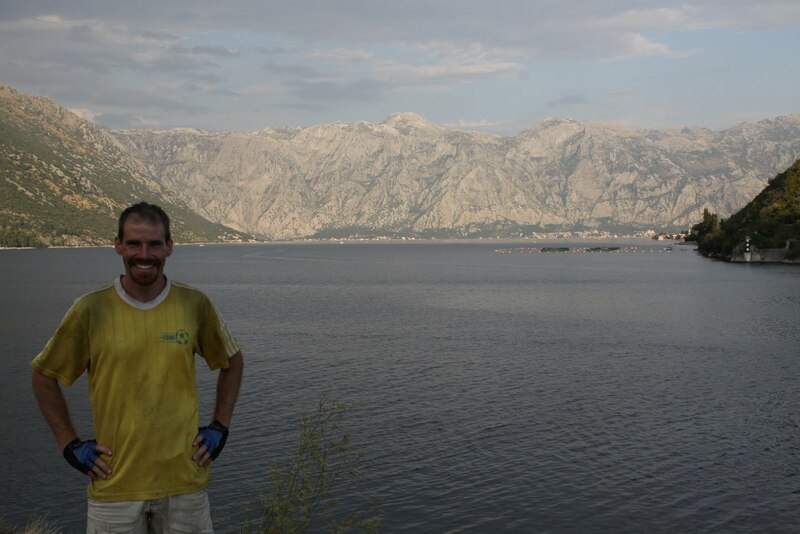 Me in front of the Bay of Kotor. Our Lady of the Rock on the man made island near Perast, Montenegro. The island was built by generations of mariners who would take rocks there. We rolled into Montenegro without much ado. However, as we got closer and closer to Kotor, my eyes had a lot to ado about. While we were definitely on the right road, we were never quite sure what part of the bay we were looking at. 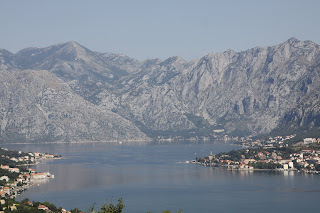 The bay has two narrows, but I guess the Bay of Kotor is only past the second one. It was confusing, but more excitingly, it was amazing. We rolled in as the sun was setting and just kept being more and more awed with each turn. A small town on the Bay of Kotor. We opted to take a dinner break in Perast. It was a great meal, but also bad timing. By the time we finished, it was dark. We found a workable campsite at the end of town, but a women was fishing on it. We opted to push on and found a beach that you can rent space on during the day. It was pretty quiet and a great spot considering how late it was. 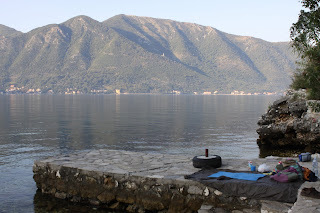 In the morning, when we were able to have a proper look around we saw that we could have camped on the other side of the beach in the grass and had a shower. Oh well. That is why you are supposed to get to your campsite in day light!!!! Our restaurant seating. That kitty owned the place. Grapes were growing from the ceiling. Our campsite near Drazin, Montenegro. 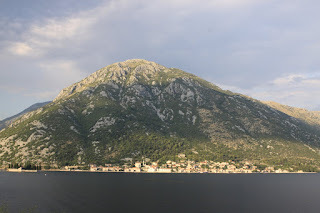 The Bay of Kotor continued to amaze the next morning. 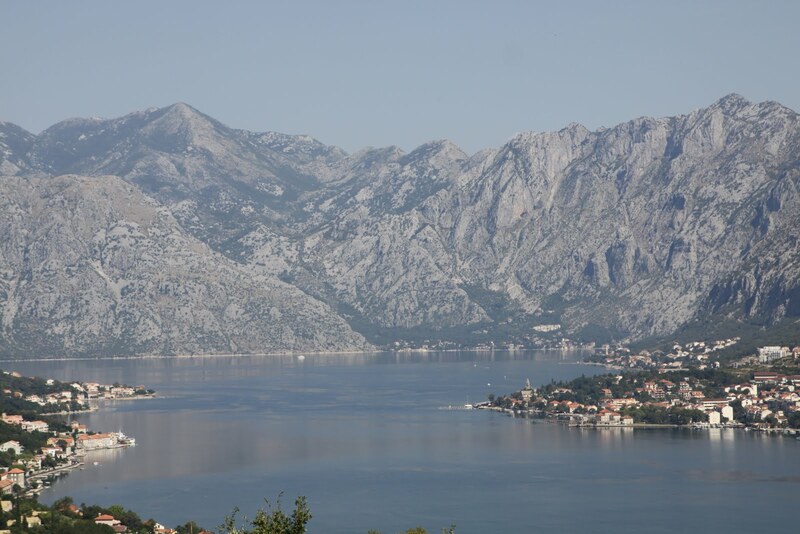 Is is commonly called a fjord, but is apparently just a submgerged river canyon. I can only imagine what it used to look like. 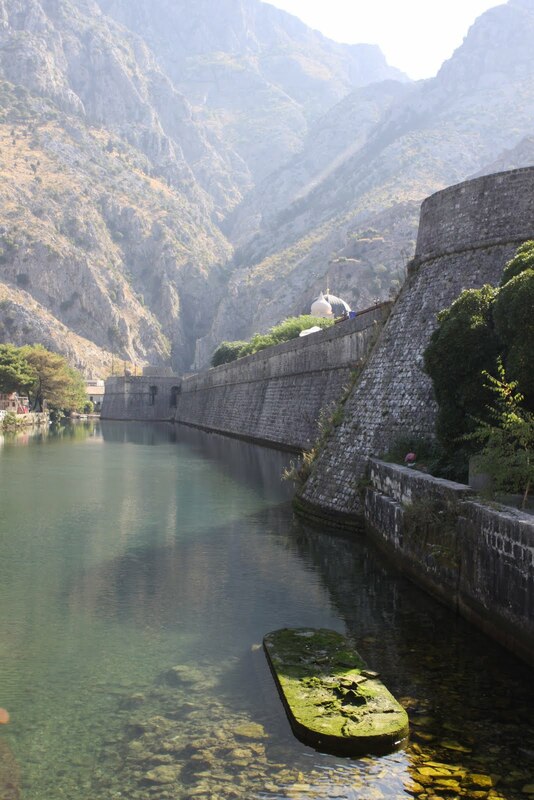 In northern Montenegro they have the Tara Canyon which is only 200m shallower than the Grand Canyon. I was disappointed that I didn't have time to make it up there. A view from sea level of the Bay of Kotor. The next morning, we kept rounding the bay until we got to the bay's namesake, Kotor. We got there early and were able to poke around the town, but it seemed to just be a tourist town. When the cruise ships rolled in, we were very ready to go. The town just isn't big enough to hold that many people. 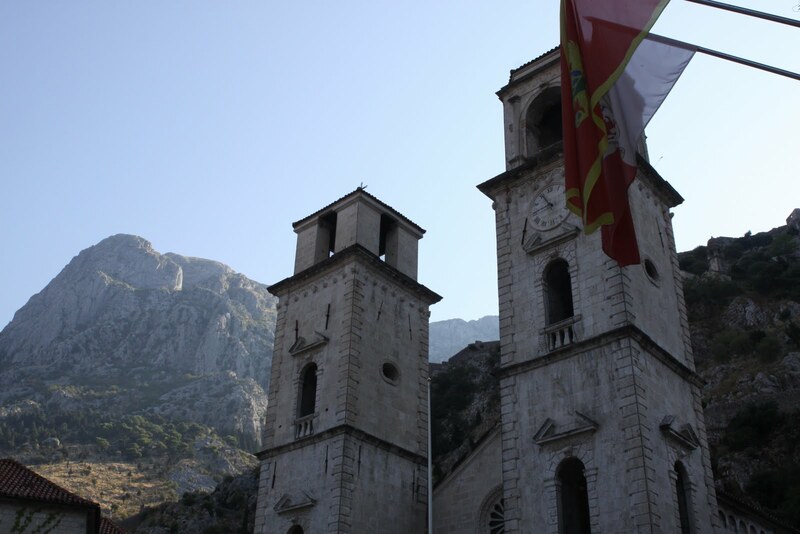 Saint Nikolas' church in Kotor. 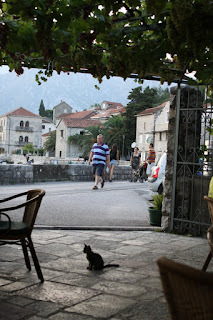 There were a number of well fed stray cats in Kotor, but this one was boss. 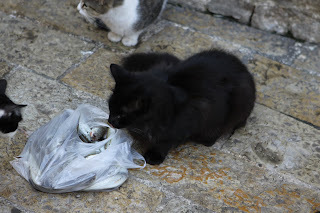 None of the others went near while it was eating. The river on the outer walls of Kotor. We ducked out and started heading up, up, and farther up. 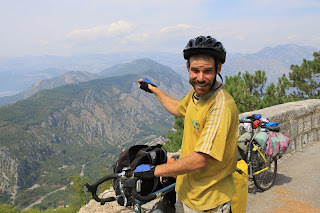 I believe we had an 1100m climb directly above Kotor which gave better and better views of the bay. 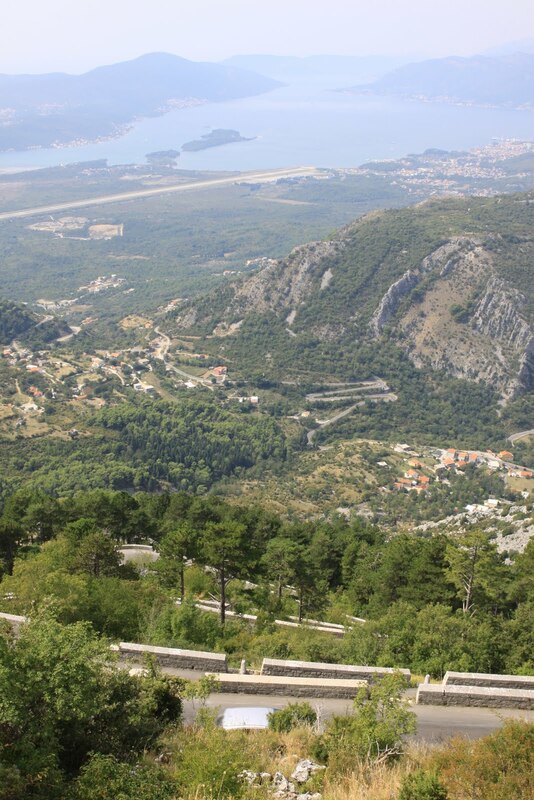 Eventually, you could see all the way out to the Adriatic Sea. This was a big day for me. I was hoping to get all the way to Theth. Davida and I talked about it and found a compromise that didn't include us talking about him stopping to pick raspberries every five minutes. That man can spot free fruit anywhere. 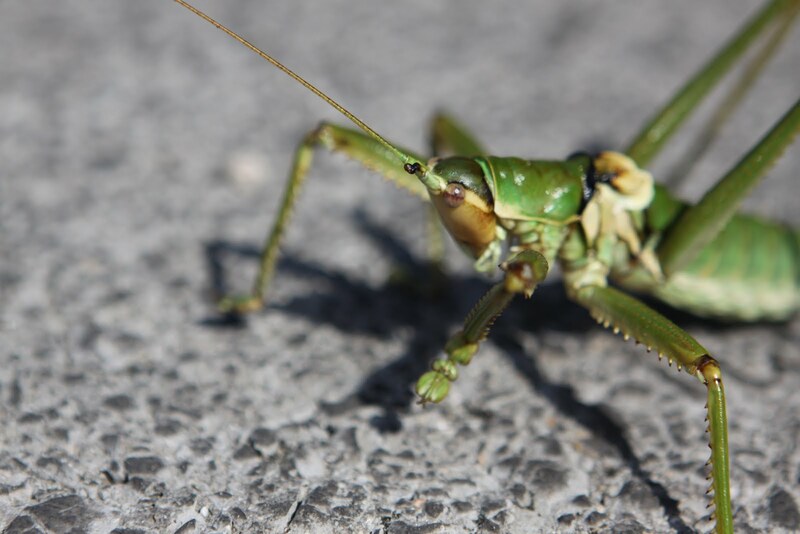 A not so friendly looking roadside attraction. Davida made it up the hill! While the climb was tough, it was worth it and we made it together. 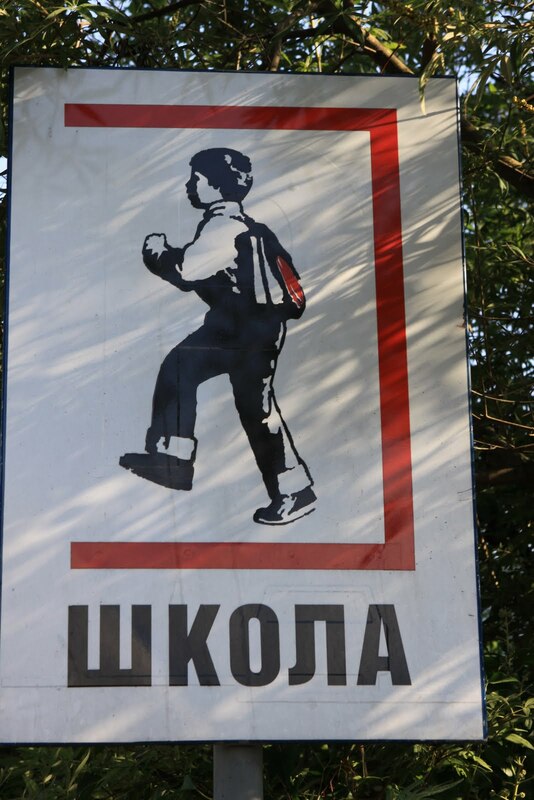 I can't recommend it enough instead of taking the main road around to Celije. 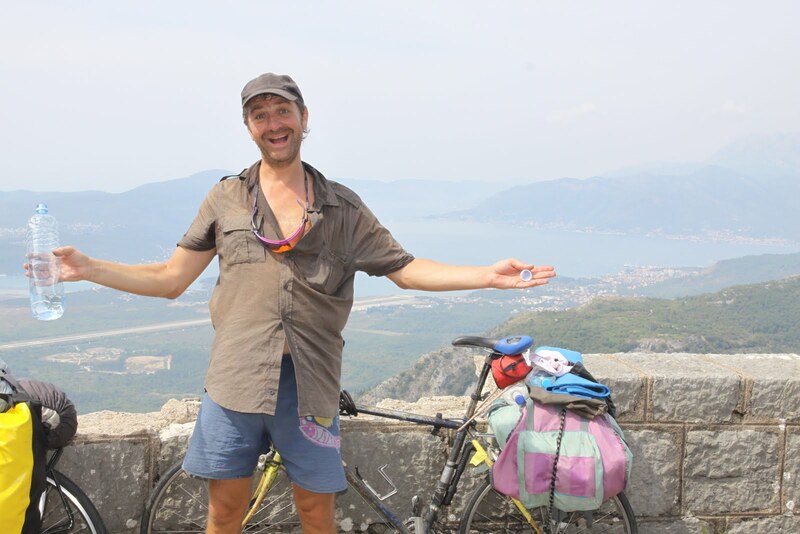 We stopped near the summit at a inn that was still being built or had just closed. Either way, they had all the chairs and tables out for us to enjoy a nice sit down lunch. Then, we are on our way to Lovćen National Park. A look at the road we had switchbacked up. 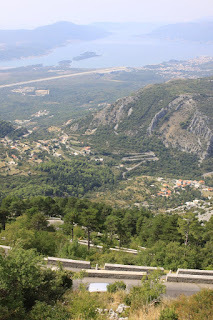 A view of the Bay of Kotor from the mountain pass.